Vincent Perez has been a long time resident and active community member of the El Paso county area. Vince graduated from Bel Air High School, where he participated in a Community Scholar program that exposed him to public policy issues of the local community and also sparked his interest in local government. Vince then went on to earn his undergraduate degree in from the Edmund A. Walsh School of Foreign Service at Georgetown University and after earning his graduate degree in Government from the Georgetown University Graduate School of Arts and Sciences, he began his work in public service. Prior to his current positon as County Commissioner of El Paso County, Vince worked in the U.S. House of Representatives as a Communications Director for the 16th Congressional District of Texas. Vincent Perez was elected to the El Paso County Commissioners Court in November of 2012. As the County Commissioner of Precinct 3, he represents the more than 200,000 residents that live in the Lower Valley and East El Paso County. Precinct 3 includes cities and districts like Socorro, Horizon, San Elizario, as well as the majority of unincorporated communities of Fabens, Tornillo, Montana Vista, Agua Dulce, Sparks, and municipal utility districts east of Loop 375. Vince, has spearheaded a wide variety of initiatives and policy reforms in the areas of criminal justice, budget management, quality of life improvement, transportation and historic preservation. 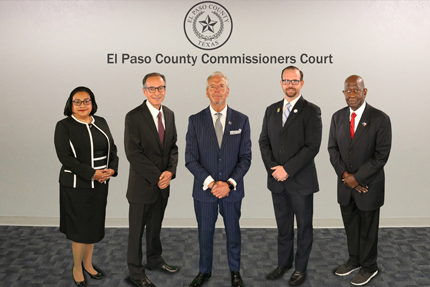 After taking office, Vince succeeded in establishing the El Paso County Criminal Justice Coordination Department and its pretrial services office, which has helped ensure that all residents have timely access to council and to help reduce the incarceration rates of low-risk defendants. He has advocated for key reforms to improve accountability in budget management and has fought to strengthen transparency and financial oversight over all elected and non-elected departments in county government. In 2016 Vince Perez was named the 2016 National County Leader of the Year for his work and success in passing critical reforms to the local criminal justice system. Vince Perez also seeks to improve the quality of living for the growing communities and neighborhood in the unincorporated areas of the County, those which he represents. 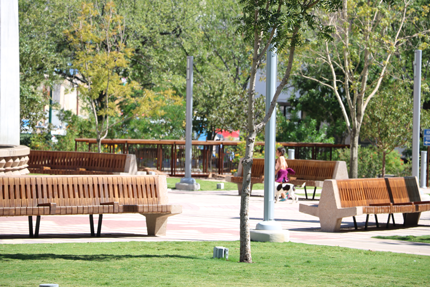 This includes requests for more park space and basic park amenities to rural parks across the county. He successfully passed initiatives, with the support of his colleagues on the commissioners court, to provide new bus service along the historic mission trail and secured funding for new National Park Service signs that now demarcate the Camino Real de Tierra Adentro National Historic Trail from San Elizario to Anthony, Texas. He has worked to provide basic services and amenities to unincorporated communities and colonias that lack natural gas systems, drinking water and waste water services, flood water disposal systems, road construction to help connectivity, and sidewalks, putting himself and his office at the forefront of promotion of growth in the unincorporated areas of El Paso. He also previously served as a Chairman of the El Paso Metropolitan Planning Organization’s Transportation Policy Board where he advocated and succeeded in the County’s adoption of the 2013 County Mobility Plan, which increased mobility across some of the fastest growing neighborhoods of the county, and fought for the increase in public transportation options for the Mission Valley, providing residents and visitors of the far East part of the county a helpful and new transportation option. He also sits on the Board of Directors for the El Paso Central Appraisal District, the Texas Border Trade Advisory Committee, the Far West Texas Water Planning Group and the El Paso County Purchasing Board. Vince is married to Claudia Ordaz Perez of El Paso. They have three dogs, Jack, Lady and Whiskey.